Even though Browser Guard promises to help you avoid malicious software that might be hiding on corrupted websites, the truth is that this piece of software is not as beneficial as it might seem at first because it is going to act in an undesirable way. The specialists of pcthreat.com have implemented a research and found out that Browser Guard is capable of connecting to the internet without your permission and is also going to flood your Internet Explorer, Google Chrome, and Mozilla Firefox browsers with various commercial advertisements. Thus, if you are already seeing ads labeled as “Ads by Browser Guard”, there are no doubts that this undesirable program has managed to infiltrate your system. Luckily, we are here to help you to remove it; thus, you should continue reading the article in order to find out the easiest way to delete Browser Guard. It has been found out that ads generated by Browser Guard are very intrusive; thus, there is a possibility that they will disrupt your browsing session because you will not be able to browse the web freely. On top of that, you might be taken to different websites if you keep clicking on ads. Unfortunately, nobody knows what you will find on these websites because Browser Guard does not monitor their content and is definitely not responsible for your safety, which is why we do not recommend keeping such an untrustworthy application on your system. Browser-guard.com is the official website of Browser Guard; however, it is not possible to download it from there. It means that this adware is distributed using different methods. 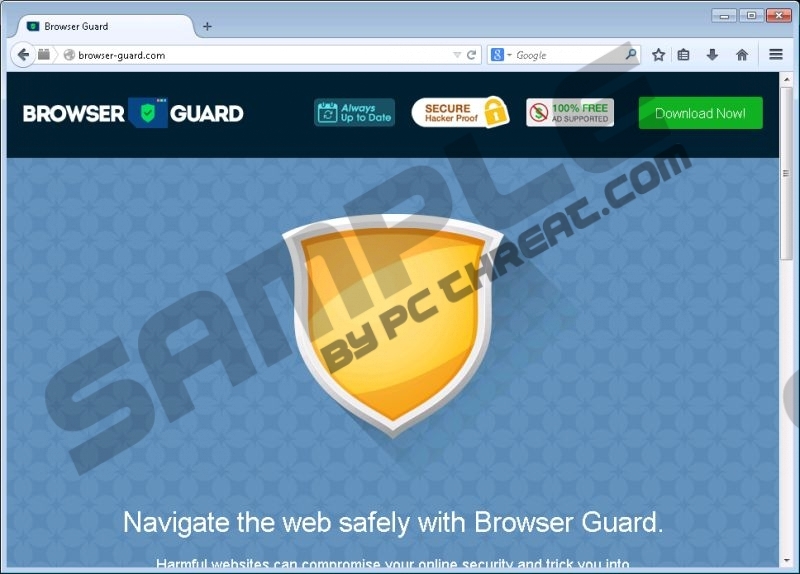 As the researchers of pcthreat.com have found out, Browser Guard tends to travel bundled with freeware. Thus, if you often download such applications, you should be extremely careful because you might install Browser Guard and even other undesirable programs without even wanting to do that. In order to prevent this from happening, you should always select Custom/Advanced installation option that will allow you to decline the installation of unfamiliar programs. What is more, it is also very important to keep an antimalware tool enabled all the time. You can remove Browser Guard via Control Panel; however, if you feel that you need some extra guidance, you can use the instructions provided below the article. Another alternative is to acquire an antimalware tool, for instance, SpyHunter, and then perform a full system scan. If you invest in a reliable security tool, you will not have to worry about your system’s security anymore because such a tool will protect your computer from different kinds of infections in the future. Locate the application that you wish to remove. Find the program that has to be eliminated. Quick & tested solution for Browser Guard removal.